The west London-based Retrospective label are set to release their first long-player May 2012. Since the imprint’s inception in January 2011, label boss Ra has carefully scoured the nu-disco spectrum to assemble an international roster of like-minded artists. In recent months, in light of the fold’s emergence, Retrospective has steadily been expanding their global network by commissioning tracks from many of the scene’s leading names. 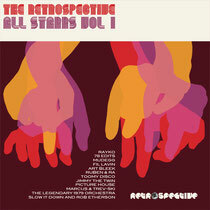 For the first in a series of three compilations, ‘Retrospective All-Stars Vol. 1’ is purposed to both commemorate this growing stature, while showcasing the wealth of talent from within the label’s newly extended family. Comprised of twelve previously unreleased cuts spread across a DJ friendly triple-vinyl pack, the album is opened in fine style by the revered Argentinian Toomy Disco’s first cut for Retrospective, entitled ‘Peppermint’. Montenegro national Fil Lavin, who took the baton for Retro005, provides a trademark lick of deep house, while Glaswegian Slow It Down and Bristolian Jimmy The Twin respectively make their Retrospective debuts to complete the first disc.